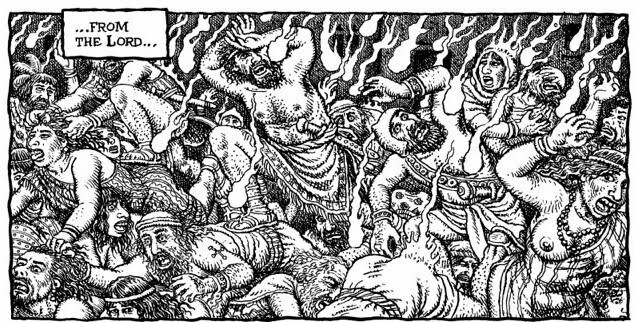 The fundamental achievement of Crumb’s Genesis for me is that it avoids something that’s central to so many illustrated versions of the bible or representations of biblical scenes: Crumb rarely idealizes his subject matter. He is not creating an inspirational text, a magical text, or a sympathetic mythology -- nor is he mocking the bible. The wonder of Crumb’s Genesis is not the unknowable wonder of God’s ways but of people’s actions as the bible recounts them. 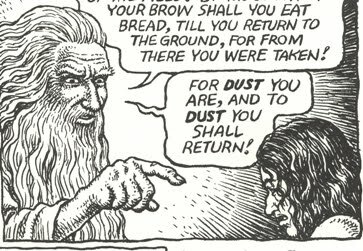 If there is reverence in Crumb’s work, it’s for the flesh, for the materiality, both ugly and beautiful (though more often ugly), of biblical characters and the things they do. Crumb’s Genesis, then, despite its use of visual source material from biblical film epics and other religious ‘propaganda’ (even comic books) is in a different genre than these previous adaptations. In an interesting and substantial post, Ng Suat Tong compares Crumb to another tradition of biblical art by invoking Michelangelo, Blake, and others, arguing that, if we look at images from these artists side-by-side, we’ll agree that Crumb gets the worst of it. They look very similar to me: Intense, stern, white-robed patriarchal males with long flowing white hair and beards, sporting furrowed brows of disapproval as they point and chastise their creations. Equally powerful images by two great cartoonists. 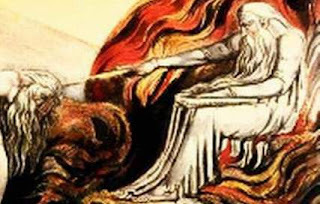 Also, Michelangelo and Blake are not illustrating the same thing in the images Suat uses; I think the figure in Blake's Ancient of Days is his god-like character Urizen, who, in Blake's mythos, represents values often opposed to that of the Christian god; in fact, Urizen embodies some 'satanic' attributes, at least as Blake sees them. These artists have different beliefs and each one’s version of god is really an image of a very different character, though they are close enough visually to make a valid comparison. On a thread at ComicsComics Noah Berlatsky asks Tim Hodler: “Do you feel that Crumb’s Genesis can in fact stand next to Blake?” I would answer yes, but you have to be clear about the grounds of the comparison. And as the above images show, Blake and Crumb -- at times -- have a similar coarseness to their work that connects them and their methods as it distances them from Michelangelo. But as a mythologist, Blake’s work, like Michelangelo’s, is often more idealized and lyrical than Crumb’s. Perhaps coarsely put, Blake is metaphysical and Crumb is physical; but even this doesn't prevent them from participating in a related tradition of religious iconography. Hey Ken. Thanks for this thoughtful post. I don't get the sense of insistent physicality necessarily from the image you show there. Rather, it feels more classics illustrated to me; a picture because there needs to be a picture. The Blake, as you say, is more lyrical, but not because Crumb has opted for unlyrical (to my eye) so much as because he hasn't opted for anything in particular. I guess as just one point — if the thrust of Crumb's Genesis is the physicality and humanity of the story, it seems like he would really need to think about and solve the problem presented by the manifestly spiritual and divine material. That is, how do you emphasize the humanity of God when God is clearly not human? I don't see any effort to wrestle with that here; just a straightforward presentation of God in a very familiar guise. Basically, I guess, I don't think it's enough to approach the text as a "straight man." Texts don't speak by themselves to themselves; a reader (and an illustration is basically a reading) has to actively interpret and respond to make the text his or her own. Crumb is trying to forego that process — which basically means he acts by instinct rather than thinking things through. The result is an interpretation which in the portions I've seen seems slack and disengaged rather than objective or physical. Anyway, I should note that Tim politely declined to answer my question because he's got a piece on Crumb coming out in the new TCJ — so you can read his thoughts there! “Basically, I guess, I don't think it's enough to approach the text as a "straight man." Texts don't speak by themselves to themselves; a reader (and an illustration is basically a reading) has to actively interpret and respond to make the text his or her own." I think that you are misreading my metaphor/analogy a little bit -- I agree that every illustration is an interpretation. There is, of course, no way to literally play it straight. But I think Crumb has solved many of the problems you want him to, perhaps just not in the way you want. And the 'familiar guise of God' -- should we downgrade Blake too? -- seems intentionally selected to make an interpretive point: god is made by men to look like a man for specific political reasons. It’s odd that Crumb’s work seems like a respectful de-mystification – which is a contradiction. "Crumb is trying to forego that process — which basically means he acts by instinct rather than thinking things through." Crumb seem to have taken the book pretty seriously and to have read a number of translations and biblical commentary by scholars. I like the use of the phrase "Slack". I think Crumbs work is a link in the legacy of Slack that Coupland/Linklater helped to define. Its an intuitive positioning of the Biblical literature to its own baggage. Intriguing. I'd like to see some comparisons to Wolverton's Bible work as well. I find the line quality and some of the hatching similar, and the tone is eerily parallel. Both works incorporate varying degrees of the grotesque (less so for Crumb in this work) in their interpretations. I think that Crumb renders the text in such a way that it stamps out, or denies, a, if not the, most important thing about the Bible, and Genesis in particular, in that it refuses to depict creation as essentially wonderous, awesome and, most importantly, good. Crumb renders through weary eyes of the skeptic, or the cold eyes of the materialist.Since the illustration can be thought of as an additional reading of the text, along with the text itself, that vision compels us to look away from what that texts seeks to communicate to us; That transcendence is possible, and that the divine exists in all creation. If the text were being literally read aloud by Crumb, it would be spoken with an edge that wouldn't need to add, "Yeah, but it's all really horshit so don't worry so much". That's fine, of course, but it isn't the neutral voice of an mere illustration. We're reading Crumb reading the Bible. I wish he would've acknowledge that more directly and ran with it. Noah wrote "...if the thrust of Crumb's Genesis is the physicality and humanity of the story, it seems like he would really need to think about and solve the problem presented by the manifestly spiritual and divine material. That is, how do you emphasize the humanity of God when God is clearly not human? I don't see any effort to wrestle with that here; just a straightforward presentation of God in a very familiar guise." Actually, the God presented in the opening chapters is so physically present as to be startlingly unfamiliar, especially to an audience whose concept of God, like yours, is far from anthropomorphic. When God announces his intention to Noah of releasing the Flood, he appears standing in a meadow, just past a slight rise, with Noah standing in the foreground holding a sickle. This is followed, as God continues to speak, with God sitting under a tree with Noah, his bare feet right on the ground. We close in on God’s shadowed face as he continues, he clasps Noah's shoulder, and we pull away to see the two in silhouette as God keeps talking to him under the tree. (In the text, of course, this is all just dialogue.) We see God holding the Ark's door shut against the rain, and we often see him planted firmly on the ground as he towers over different characters and lectures them. A presentation in which God is so physically situated in an earthly environment is rare in religious art, and the effect is unsettling. However, it is supported in the original text, which speaks of God walking in the garden of Eden, and sitting and eating Abraham's food under a tree. Surely making a familiar story seem strange and new, yet doing it with a solid grounding in the original, is one of the virtues of adaptation. 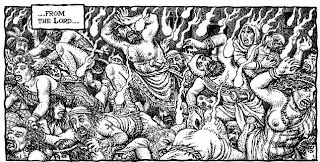 Crumb illustrates the line "And Enoch walked with God and he was no more, for God took him" with God actually clasping Enoch as they float together up into the sky, poor Enoch's legs flailing. (This is presented very matter-of-factly in the "begats".) From Alter's notes, I learned "This cryptic verse has generated mountains of speculative commentary, not to speak of two whole books of the Apocrypha. The reflexive form of the verb 'to walk' that occurs here is the same form used for God's walking about in the Garden. Instead of the flat report of death, as in the case of the other antediluvians, the euphemism 'was no more' (literally 'was not'), which is also applied to Joseph, merely supposed by his brothers to be dead, is used. 'Walked with' surely implies some sort of special intimate relationship with God, but what that might be is anyone's guess. This is one of several instances in the early chapters of Genesis of a teasing vestige of a tradition for which the context is lost." The portrayal of God as an old man with a white beard is, indeed, familiar, but the character who emerges from these early chapters is memorable. We see an all-powerful and apparently somewhat addled giant who appears surprised to see people doing evil on his earth, seems to regard Noah as a kind of pet, inhales the sweet savour of Noah's post-flood sacrifice, and taps his forehead as he tells a terrified Noah and his sons that he'll remember not to destroy the earth from now on when he sees the rainbow he's just made. The effect is to make the reader more sympathetic to the people, like Abraham, who have to deal with this figure, as fits a humanist adaptation. You say Crumb "forgoes the process of interpreting and responding to make the text his own," even seems "slack and disengaged", but that's just not true. The version of God I've described diminishes as the book proceeds, though. The myth & magic of the Garden of Eden & the Flood gives way to increasing realism as we get into the Patriarchs, to the point that, when we see God one last time as he appears in a dream to the aged Jacob, this is itself surprising because it's been so long. It's also significant that this happens to Jacob, and not Joseph, who we've been following for a while at this point; each Patriarch has a successively distant relationship with the deity. Joseph never encounters God, but only gets information from him in symbolic dreams. Jacob sees him in dreams and visions. Abraham has these and also encounters him several times- but sometimes sees him floating, and always is at a more forbidding distance than he appears to Noah. This evolution is an intriguing aspect to the original that is brought to the fore in a visual adaptation- it never occurred to me when I read Genesis, but it's certainly there- and Crumb's alert handling of it shows his conscious presentation of the problem of the humanlike manifestation of the divine. You say "he would need to think about and solve" it, but since when does an artist need to solve the problems he presents? Your continued interest in talking about this book is starting to make your reluctance to read it look odd. Hey Alan. Yeah, I don't have any defense to that. It raises interesting questions for me, but I've seen little to suggest that I'll enjoy reading it. But obviously I should. at this point. Diana -- I think that Charles Hatfield has some comparisons of Crumb and Wolverton at his blog. "in that it refuses to depict creation as essentially wonderous, awesome and, most importantly, good." Uland: To me, the first few pages look wonderous, though very restrained. I don't think Crumb wants to get across that creation is good or bad -- this is what I mean by "playing it straight." So I think you are right to see that he does not communicate a positive judgment; what you see a flaw, I see as a strength. If the text were being literally read aloud by Crumb, it would be spoken with an edge that wouldn't need to add, "Yeah, but it's all really horshit so don't worry so much". Interesting -- that might be how Crumb would read it, but I don't get that tone from his text. "Actually, the God presented in the opening chapters is so physically present as to be startlingly unfamiliar, especially to an audience whose concept of God, like yours, is far from anthropomorphic. Alan: I wish I had put it as you have. I agree with nearly everthing you say. "so physical as to be startlingly" -- If I were to write a blurb for the book, I would steal this idea. "Hey Alan. Yeah, I don't have any defense to that. It raises interesting questions for me, but I've seen little to suggest that I'll enjoy reading it. But obviously I should. at this point." I know it's not possible, but try to forget everything that's been said about Crumb or the book if you read it. Critical conversations can be helpful, but they can get in the way, too.